Firefox CookieMan is a simple tool to help you manage your cookies in Firefox from outside of the browser. There are browser extensions that do the same thing, but they only work with the current profile. You can use this to edit any profile accessible on your local system. Note: HazteK Software is not affiliate with the Mozilla Foundation or Firefox in any way. 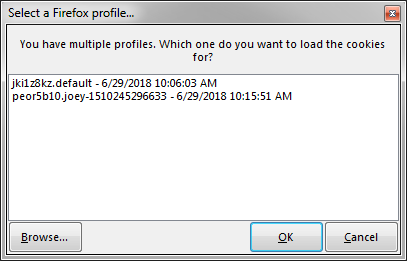 This is a third-party tool that interacts with standard Firefox configurations and databases. Firefox CookieMan requires the .NET 3.5 Framework. It also requires the Microsoft Visual C++ 2005 Service Pack 1 Redistributable Package MFC Security Update. What do you think about Firefox CookieMan? Rate it! You can delete a domain by selecting all the cookies belonging to that domain and deleting them. It will automatically remove the domain from the database. I’ll try to implement cookie transfer from one Firefox profile to another in a future version. I do not use Chromium, and I am unsure of the format of the cookie format used, so cross-browser compatibility like this is most likely never going to happen. Sorry.